We’ve had one of those years at our house. You know, one of the memorable ones for crappiness. Things are looking up however, for the most part. We even received rent money and the security deposit this week on our rental property, and the new family begins moving in today. They don’t appear to be hoarders, and yes we did have the house fumigated. Last weekend my husband and I painted all four bedrooms and this week I cleaned all the floors (again), the bathrooms (again), windows and the broiler. He cleaned the windows on the enclosed patio, put in a new toilet and cleaned the fireplaces etc. That’s over finally. We’ve had a few health issues, some accidental, some related to being over 60 I guess, but so far we’re carrying on pretty well. One thing that has always kept me from panicking when the worry sets in is working in my garden. That’s right, the garden comes in ahead of ATiM. I will try to participate a little more going forward however, as I have missed our discussions. 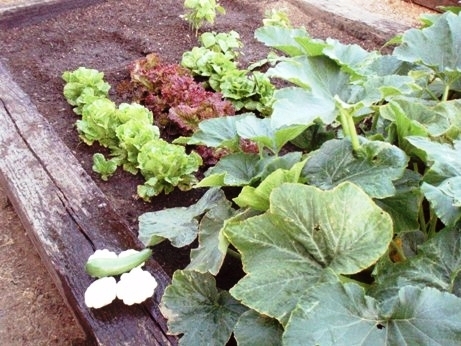 Anyway, I’ve been growing veggies since I rented my first house at age 20. When the kids were little we had a fruit orchard and really large garden in the back part of our property (we have a half acre). That’s all been replaced with a rather large warehouse for the business. We did manage to find a nice growing spot on the side of the house, outside the bedroom window, for a small garden. Since it’s just the two of us now it’s perfect and I can look out the window and see our handiwork. This year I planted a couple of things I’ve never had in my garden before, bok choi and Japanese cucumbers. 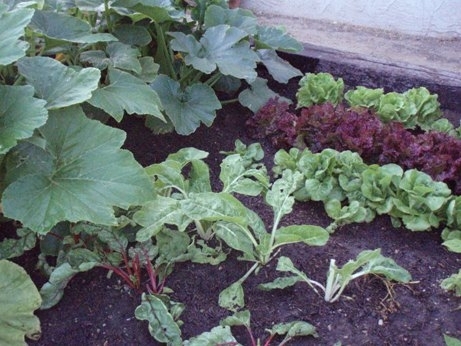 In the photo below the bok choi is in the center bottom of the picture between the beets, on the left, and the Japanese cucumber. 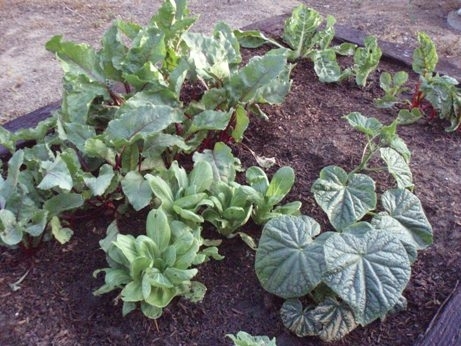 At the back of the photo is swiss chard, which we have in our garden nearly year round. I saute the chard in safflower oil and then add tamari and a little sesame oil and add it to brown rice after the rice is cooked……………………..yummy. 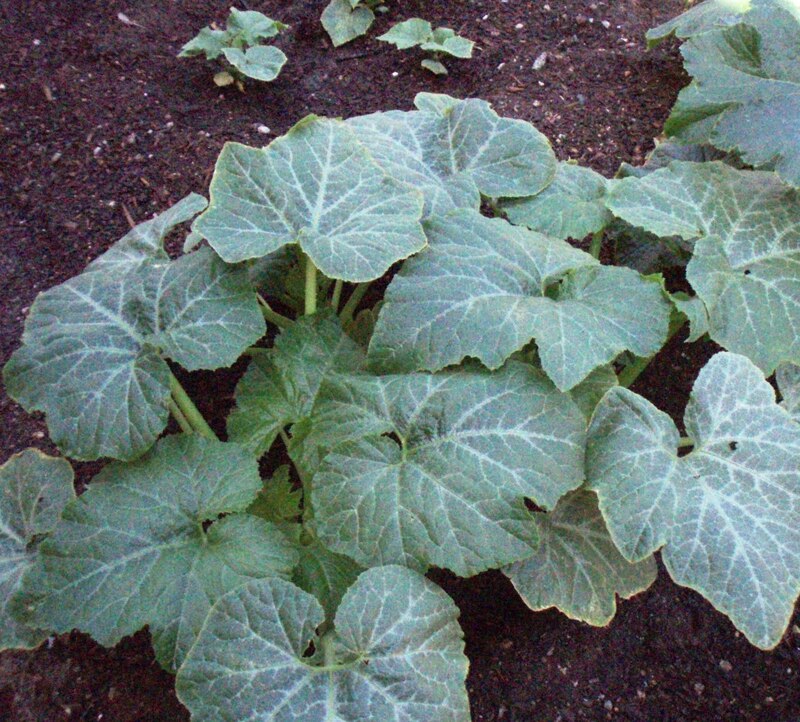 In the photos below are three kinds of summer squash, a few remaining green beans (the dogs dug up most of them), three kinds of lettuce, more swiss chard, and I just planted pumpkins and acorn squash last weekend. These new veggies took the place of the snow peas, which we already ate, also yummy. We’re taking a couple of days off this weekend and heading to the beach tomorrow, my favorite destination, so have a great weekend everyone. There are hobbies and then there are pastimes. To me a hobby is when you create something useful or artistic, such as a garden, rebuilding an engine, writing a short story (for fun), knitting, quilting, etc. (you get the idea). A pastime is more along the lines of doing something you enjoy, hiking, reading, watching football, camping and what not. I work pretty hard all week, as many of us here do, and while I always have chores, grocery shopping or getting together with friends and family, I still try to work on one of my hobbies every weekend. Here in CA we have a long growing season so I’m able to have a garden in the spring, summer and fall. We usually get frost sometime in Jan. or Feb. so whatever’s still out there is generally a goner by then. By March though I’m off and running again. My husband built me a raised bed garden a few years ago, he’s awesome, and it’s so much easier gardening now because my back kills me if I’m bent over for too long. This year I found one zucchini that got a little too large hiding along the edge of one of the railroad ties. 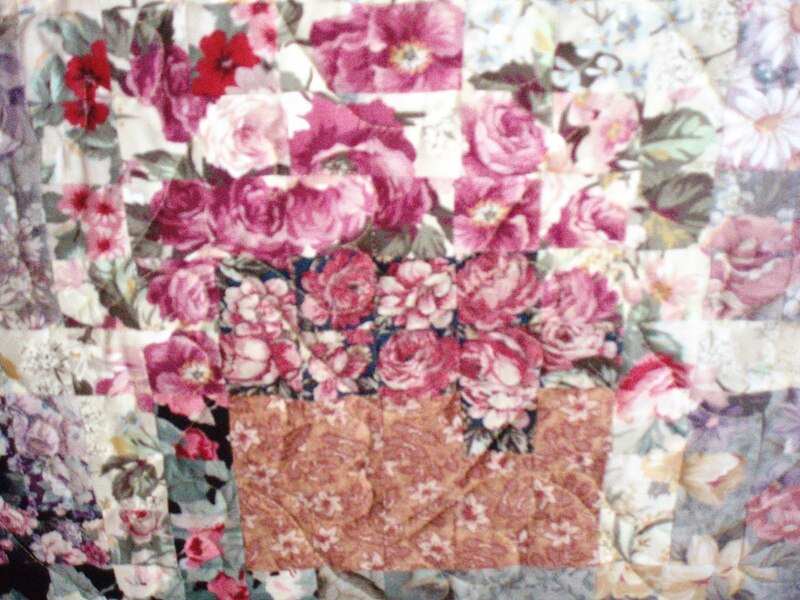 I also create watercolor quilts when I have time. Luckily, we have a room where I can spread out fabrics and such and make a big mess, then just shut the door and ignore it for a week or two. 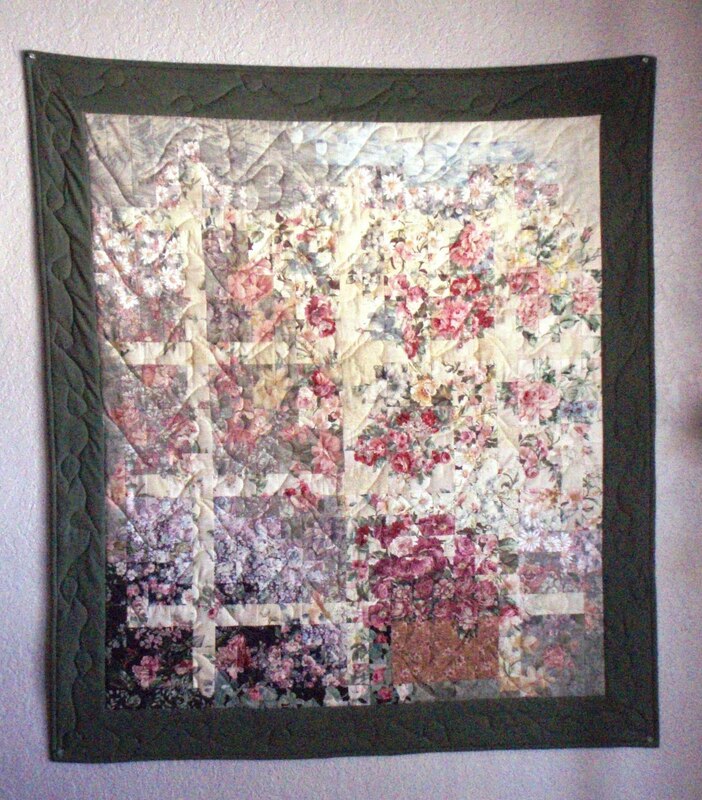 This quilt is made from two inch squares I cut and then pinned to a large piece of batting on the wall. I kept moving the pieces around until I got what I hope is an impressionistic image of a lattice fence, with a flowering vine, and clay pot in the bottom right corner. This one took about six months to complete. As you can see from the pic of the flower pot, it looks better from a distance.